"The time and labor necessary in making these potencies higher than the one thousandth makes hand-made potencies impractical, therefore, for potencies higher than the thousandth machines are used and water is used as a menstrum or medium. There have been introduced into the homeopathic school in the last sixty years a number of these "fluxion" potencies under the names of the inventors of the machines. All of these potencies we have made or sold in past years, but the best and most accurate machine is the Skinner machine. During the last seventy-five years a great number of ardent homeopaths devised machines to make these high potencies. Thus Swan, Deshere, Fincke, Boericke, Lehrmann and Skinner all invented machines and made potencies. Some of these we made and sold. We made the Swan's, the Deschere's, the Boericke's and the Skinner's potencies. Of all these, the outstandingly best was the Skinner machine and the Skinner potencies which were made on this machine. All others were finally discarded and the Skinner potencies became the standard high potencies of the homeopathic field. "Dr. James Tyler Kent was, while living, the foremost advocate of the use of high potencies and he endorsed the Skinner potencies as will be seen from the following letter." Chicago, Ill., July 30, 1903. "The succussing in the fluxion potency machines is obtained by the force of a stream or streams of water being forcibly squirted into a container containing the lower potency of the remedy to be potentized. The Skinner potencies are now the most widely used fluxion high potencies in the world. They have stood the test of time and now have no equal." Boericke and Tafel never made the Swan potencies. The Swan back potencies were given to Boericke and Tafel by Swan's widow when Swan died, and they sold them. Although Kent says Fincke's process is "unknown" his process was a matter of public record, since it was patented in 1869. The explanation of "succussing in the fluxion potency machines" is something which has come up, time and again, when B & T discussed this machine in a public forum. This will be expanded upon below. It is not known what happened to the Skinner machine in New York. There was, however, a second Skinner machine built by the Penn Machine Company in Philadelphia, and installed at the B & T premises at 1011 Arch Street. Although the records of purchase are no longer extant, the quality and type of machining on the device is consistent with a manufacturing date of sometime in the 1920s or early 1930s. The machine sat in a cabinet, with a glass door that could be slid shut. It had six potentizing stations. Each was completely separate from the other. The potentizing vials (seen at the right above  full size) were attached to an axle with a spring. They were spherical on the bottom, and had two protrusions on the side. These "nubs" anchored the vial into the holder on the axle and prevented the vial from slipping. Each vial operated in its own chamber, accessible by a hinged door which had a window in it. The water used was gravity fed from a large five-gallon jar. The operation was, essentially, similar to the original Skinner machine. The water was pulled into a vertical syringe and the syringe was emptied, directly into the receiving vial. The vial was then quickly upset, causing all the liquid to be shaken from it. The vial then returned to the upright position and the process repeated. By 1920 there were only two pharmacies in the United States manufacturing high potencies: B & T (on the Skinner Machine), and E & K (on the Kent machine). By the 1950s only the Skinner potencies from B & T remained in manufacture. Our homeopathic cultural teaching has consistently reiterated the dilution and succussion process, and when anyone figured out how long it actually took to produce a 10M and wondered "how do they do it?" the answer was "with a machine." That was usually the end of the questioning. Through the 1960s, all the high potencies sold in the USA by all pharmacies came from either B & T or E & K. Some said that they got their high potencies from Ainsworths in England, but when the pedigree of those remedies were traced it was found that Ainsworths purchased most of their high-potencies from B & T. By 1960, no pharmacy in the USA was manufacturing potencies above a 30th or a 200th, except B & T. If one bought a 10M, 50M or CM from any other pharmacy in the USA, one probably got a B & T Skinner potency. It is interesting to note that the in the B & T literature of the time, it was mentioned, with insistence, that this machine does not produce fluxion potencies but, rather, succussed them at each step. This myth continued through the 1980s. "...We have always believed that even in making high potencies, the method of Hahnemann should be used; that is, the succussion method. The Skinner Machine uses the succussion method of Hahnemann. Every potency made on this machine is succussed." Although the Homeopathic Pharmacopoeia of the United States (HPUS) specifies, in section 11, that succussion is necessary for all remedies made, the reality was that NO remedies above the 200th were being physically succussed. The first machine in the USA to actually make remedies with dilution and physical succussion, as specified in the HPUS, was made by Michael Quinn in the late 1980s. Through the 1960s and 1970s the market was small, everyone who manufactured the remedies knew each other, and everyone was using the B & T remedies without complaint and, apparently, with good results. When I first visited B & T in 1981, I was shown through the facility by Gus Tafel. He showed me the machine. I asked, "where is the succussion?" He gave me the standard line that the liquid is squirted, at great pressure, into the potentizing vial and the force of the stream, combined with the spherical bottom of the receptacle, created a vortex that duplicated the energy gained from succussion. It didn't make sense to me, and I let it slide. When B & T was purchased by The Schwabe's Group Dutch branch, VSM, in 1987, one of their first projects was to re-build and re-calibrate the famed Skinner Machine. Section 11 in the HPUS specifies (for single vial [Korsakov] manufacture) that 5ml is placed in a 15ml flask, succussed, and shaken out. Then another 5 ml is placed in the flask. This makes the assumption that 1/100 of 5ml remains in the flask. 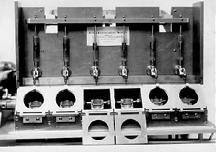 When re-building the Skinner machine, it was found that the dilutions that were being made were, in reality, close to a 1:17 ratio rather than the 1:99 which is specified in centesimal manufacture. The vials in the Philadelphia machine were the same size as the vials in the original Skinner machine at the Faculty of Homeopathy in London. It is, therefore, obvious in retrospect that "soft science" of the 1880s certainly did prevail, and, with all the arguments of the time taken with a grain of salt, the original Skinner machine could not have been producing true centesimal potencies either. It has always been pointed out by those manufacturing the Fluxion potencies that they were never the same as Centesimal Hahnemannian potencies; that a 10M from a Skinner Machine is not the same as a 10,000 CH. As long as these potencies were identified as a "Skinner" potency, there should have been no problems in knowing what you were getting. In 1990, B & T began to run a series of ads in homeopathic journals, discussing their re-building of the Skinner Machine and letting everyone know about how it worked. By doing so, the myth was destroyed. Everyone had been supporting the myth. B & T swore the remedies were succussed at each step. Practitioners thought that when they ordered a 10M they were getting a hand-succussed Hahnemannian centesimal, when what they were really getting was a Skinner preparation made as 1:17 (but thought of as 1:99! ), and run through the machine for 9,000+ cycles. That they were not succussed was not received well by some in the homeopathic community. That they had always "worked" seemed to be an issue lost in the debate. There was once a baker who, everyone agreed, made the best cakes ever. "Certainly," they said, "he makes them with cream as the King's cook book suggests." They asked him, "do you make it with cream?" And he smiled. One day, the baker announced that he will divulge his secret recipe. "I do not use cream," he said. "But your cakes are the best! You must use cream!" "Well, I don't," said the baker. "But do you like my cakes?" "They are the best," was the answer, "But what about the King's cook book?" The Skinner potencies had been in continual production since, at least, 1900. Their clinical record was well recorded. Every person who had bought a potency over a 1M in the last 30 years from B & T, from Borneman, from Standard, from Ainsworths, or from a number of Indian pharmacies has been using, in all probability, a Skinner potency. The results speak for themselves. But the "cat was out of the bag." The Skinner machine had difficulty on two counts. First, it had been generally agreed that potentizing involved dilution and succussion. This, and the proportions needed to produce the remedy are clearly stated in the HPUS. Furthermore, B & T was identifying the potencies made on the machine with an "SK." While the designation of "X" and "C" were listed in the HPUS along with "CH" ("centesimal Hahnemannian") and "CK" ("centesimal Korsakovian") the designation of "SK" was not official. And because of this, B & T ran the risk of the FDA seizing any remedy bearing the designation "SK" as being "non-compendial." In 1991 the question of the Skinner machine came before the Council on Pharmacy of the Homeopathic Pharmacopoeia Convention (HPCUS). B&T had asked for the machine to be approved, rather than asking for approval of the process. The HPCUS had no precedent for approving an instrument. It had limited itself to the approval of methods and procedures. It was generally agreed that all previous potentization methods had included succussion and that a method without this step was neither appropriate or necessary. The fluxion issue was, therefore, dropped, and the use of the Skinner machine by Boericke & Tafel ceased.